You could be enjoying your new car and saving money in no time. A Novated Lease is a three way agreement between you, your employer and a finance company. It’s a tax efficient way to purchase a car and save money. You choose the car and your employer pays the finance company from your salary. These payments are usually taken from your pre and post-tax salary, meaning you pay less income tax. 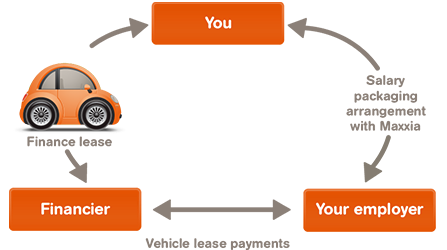 Entering into a Novated Lease means that your employer agrees to pay your vehicle lease payments out of your pre-tax salary. Paying with pre-tax dollars can effectively save you money as your income tax is calculated on the reduced total of your salary or wages minus car payments. Your disposable income is greater than it would be if you were paying for the same vehicle with post-tax dollars. If Novated Leasing is a benefit offered by your employer, you’re able to choose the vehicle you wish to drive without the restrictions that typically apply to a company fleet. Once you’ve purchased the vehicle and made the finance arrangements in your own name, you then enter into a Novation Agreement with your employer. You agree to “salary sacrifice” part of your earnings in return for the benefit of the car and related costs. Your employer agrees to be responsible for making your lease payments and other agreed costs for the term of your employment. Your employer makes payments on your behalf and deducts these payments from your pre and post-tax salary. A Novated Lease is classed as a ‘Fringe Benefit’ by the Australian Tax Office. This is because your employer takes a contribution from your salary and provides you with a car for both business and personal use. This benefit attracts Fringe Benefit Tax (FBT). The amount of tax you need to pay is a tax office formula based on the value of your car (we work all that out for you). For every after tax dollar that you contribute (these are the payments made from your post-tax salary), you reduce the amount of FBT you need to pay by exactly the same amount. So by making contributions from your post-tax salary to cover the amount of the FBT, you remove your FBT liability. c. Buy your car for its residual value (this is the value of the vehicle at the end of the lease). If you then decide to sell your car, you benefit from any profit you make, which is tax-free.